This pretty Blakeney Summerhouse has been installed by our in-house fitting team in our customer’s garden in Leamington Spa, Warwickshire to use as a relaxing summer house to sit in while their grandchildren play in the garden. To keep the customer from having to apply for Planning Permission for their new garden building, they asked for us to lower the roof pitch to keep it below 2.5m, which we happily agreed to. 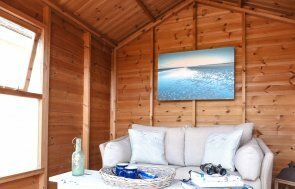 The Blakeney is a chalet-style summerhouse, with a roof overhang over the front gable, and fully glazed double doors to allow plenty of natural light inside. 2.4 x 2.4m is the size of this summerhouse to give the customer enough room inside to make it comfortable for 2-4 people. This summerhouse is simple on the inside, with just the addition of a Natural lacquer on the floor, but on the outside, the customer has made it look very attractive and befitting of their garden, as it has cedar shingle tiles on the roof, and the summerhouse has been painted in the colour Verdigris, which is a natural green/blue colour from our opaque, weatherproof Valtti paint range. If you would like some more information on our range of Summerhouses, please contact us online or call us on 01760 444229 to discuss your requirements with us.